Oh I’m so sorry, I forgot to to write it down and tell you! You have to solder bridge the middle pad to one of the outer ones. It must not be left open. Do NOT short out all 3 pads. There’s a small “E” of enable, and a “D” for disable power save mode. You can look at the datasheet to learn a bit more about the two modes. It’s there for better efficiency at low currents. Since your running it at 1.4A, short the middle one with the “D” next to it (I think it could have a bit higher efficiency). You can enable it if you want, but I would only activate it if I’m under 150mA. Edit: The 6mA is mostly because of the OpAmp quiescent current. It’s about 4.6mA typically. could you troubleshoot this driver if I send you 3 of them? If someone finds a mistake, please tell me. Note: the one airwaire (coloured yellow) is there because Eagle won’t let me create polygons without something in it with the same signal. I placed a pad there on the bottom layer, so this one airwire can be ignored. In the schematic, the pad on the input is called Bat-, it should be Bat+. And just leave C8 open. Wait, is there a 206 resistor on R1? That is 20 mega ohm. You need 20 milli ohm there. Was about to comment, R1 looks like sense resistor so I think 20m was 20 milliohm, 206 is 20 megaohm, so would make sense if no light with 20 meg in series with the emitter. Shoki you may have a 0,02Ohms 0603 resistor that you can send me 3? I currently don’t have, but I can order some, wanted to make a mouser order this weekend for the new MP3431 board anyway. If you want I can buy some 20mOhm resistors and send them to you. 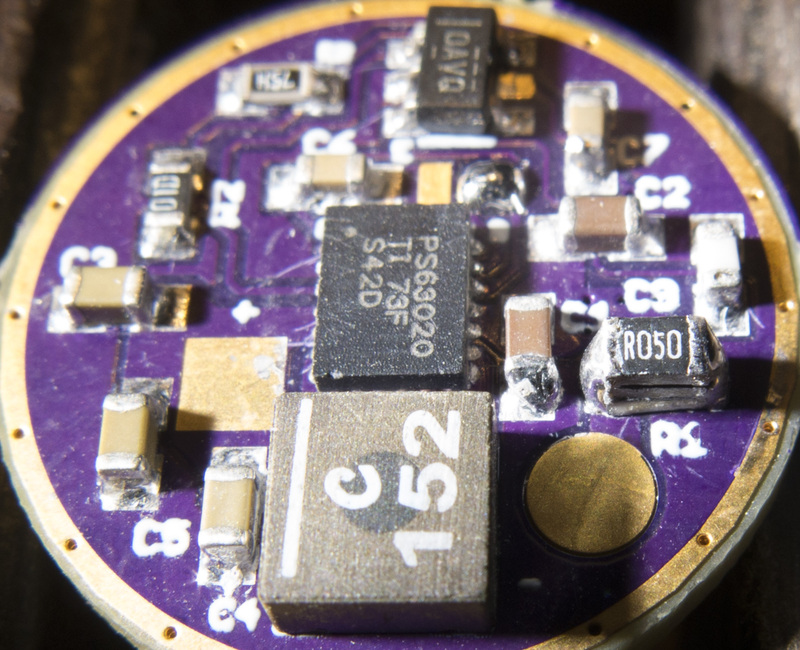 Do you have higher resistor values in the milli ohm region, just to check if the board works? The 0.02mm² wire won’t work, 1.4A through that is a bit too much (50mA is the maximum current for that size). For now, maybe a 0.1Ohms 0805 resistor fits. Just to make sure it works (and it should put out around 300mA). I can order some resistors for you, no problem. If you can solder the three resistors on top of each other, go for it. Let me know if you then still need 3 0.02Ohm resistors. so I have to reduce R2? To get less current, the gain of the Opamp has to be increased. So R2 has to be higher, or R3 needs to be lower. 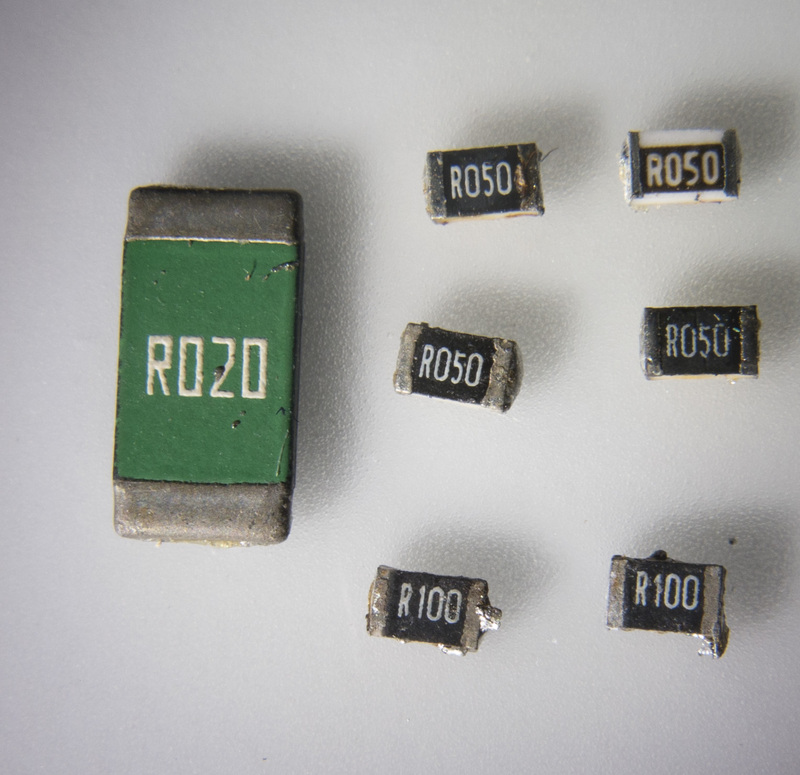 if you do a order from Mouser or digikey soon could you get me 3 0603 0.02Ohms resistors? Good to know. And the other driver with C8? Was that a driver you powered on without shorting out two pads at first? Or have you tried the now working one without shorting the pads as well? Maybe the IC is toast because you tried it without shorting the pads at first. OK, the 3rd one works as expected. The IC itself has a feedback variation of +-5mV, the resistors have variation (1% or so), and the offset by the OpAmp adds some more. Nice, now all drivers work? A fast strobe? How fast? And it quit working? Was it still hot or cooled off already when the fast strobe occured? Did it get hot in a flashlight, or was it on a bench uncooled? Even though it might have 90% efficiency, 0.5W or so will be heat. Would Silicon Labs C8051F52x/3x series work? Thank you for looking for an alternative, i’ll look into it. But for now, I managed to squeeze an ATTiny25v on there, so bistro-hd would be possible. The springpad is now smaller, but it should work (6.4mm diameter or so). It was possible because the ATTiny has one side of pins without any connection, so I removed these solder connections. On the other side, I just left the gnd pin. One problem with other MCUs is that you have to change a lot in the code to make it run, so I hope it works like it is now. I hope the 25v in a qfn package is a rev E at mouser. This is required to be able to run bistro-hd. But since it’s a driver where a lot of current could flow, I maybe won’t even solder a spring on there. A piece of brass/copper could also work, and needs no bypass. If Vf is between 2.5V and 3.6V, yes. It’s an 18mm board, but I’ll sand it down to 17mm to have copper right to the edge. Ok, I finally found my way to thread instead of just the backroom PM discussions (that there have been a bunch of). Subscribed. FWIW I've worked up a "Fet only" (ie single channel) configuration of bistro-HD (will be in next release, soon). Been meaning to anyway (actually a few such configurations, switch, indicator, OTMS, etc). It took a little compromising to match ramps to TA modegroups, mostly because without a 7135 you can't go below 11mA (1/255 * 2.8A) so modes get cutoff, but I've been thinking of ways to get around it. 16bit PWM, if the converter can actually handle such output or true, 2nd channel, enable pin PWM reduction, but Schoki says it's hard to fit the trace. 11mA ain't too bad though. It's not really moon, but it's low. 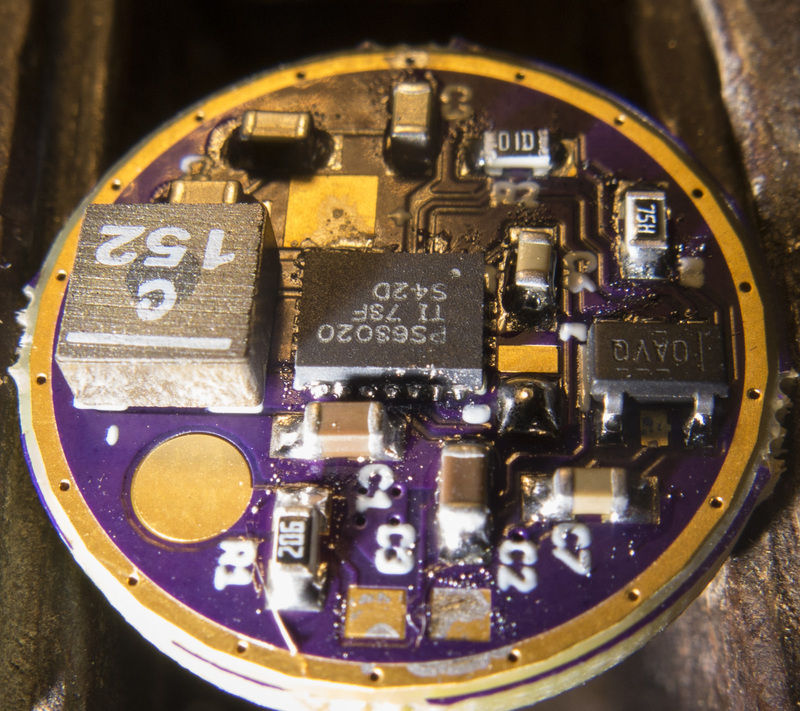 I thought I heard that this was going toward an attiny25 qfn, which I think is also on the scale of 3mm. Anyway, if you can make it still flashable (soic as shown), that's great. For software though, if you need more space, the qfn becomes a drop-in replacement from the software side. Of course the qfn might make room for that extra trace. 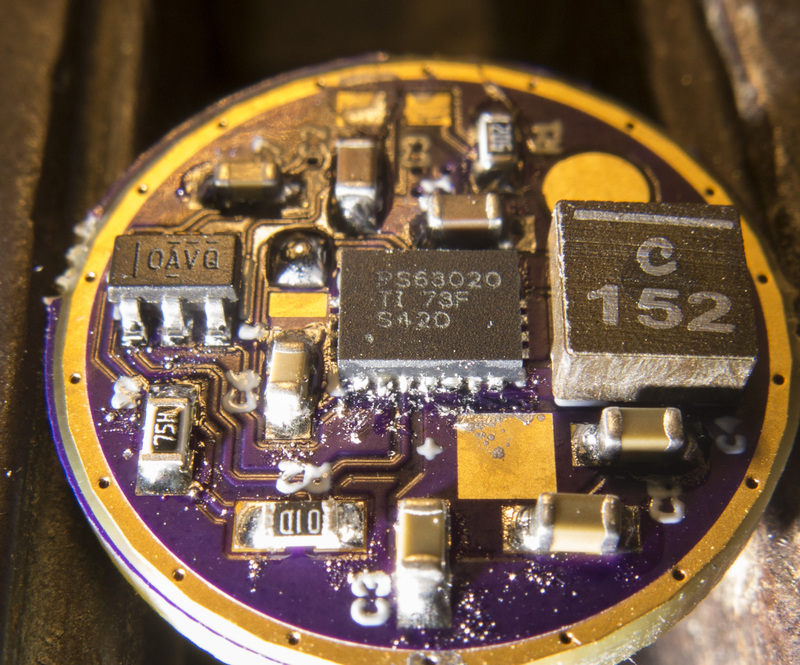 It is attiny25 qfn, the tiny is on the underside. I removed the pads that aren’t connected internally of the attiny, the springpad is now a little bit bigger.